Vango makes some great tents, but they aren’t what you want for serious expeditions. Nonetheless I’m including a Vango Tent review here because the Vango Ultralight 200 fills a really great niche and may interest a lot of people. First off, why do I say this tent isn’t for serious expeditions on high mountains? As much as it is a great tent, it just isn’t aimed at the kinds of activities that something like a Mountain Hardwear EV2 is designed for. The latter tent is meant to be strong enough to survive strong winds and heavy snow at an altitude of 7,500 meters on big peaks such as Everest or K2, the Ultralight is, as its name suggest, meant to be really light. Take the difference in weight. Most expedition-grade tents clock the scales at about 4.5kgs. Something like the EV2, which has all unnecessary weight trimmed out of it still comes in at about 2.5 kg. And it needs every one of those grams to be strong enough to do what it is designed to do. The Ultralight 2000, on the other hand, weighs a meagre 1.3 kg. That means it fills a niche for people who really need to travel fast and light such as adventure racers, people participating in mountain marathons and other similar sports where comfort is cut down to a minimum to allow for fast movement. This Vango tent achieves its very low weight by having a fairly simple design with a really low profile. 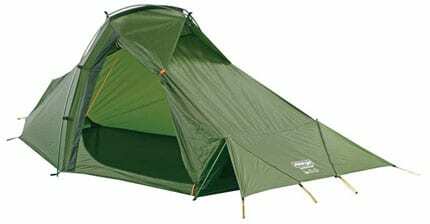 Its material is also light as are its alloy tent poles. That’s not to say this thing will be a pushover in wind or storms. It has internal bracing, which is a lightweight way of adding strength and its profile also allows it to hug the ground in strong winds. You still need to peg and guy it properly to get the benefit but it is surprising stable for such a feathery package. Like many other tents you have the option of just pitching the outer fly sheet so you can travel even lighter. But that does sacrifice quite a bit in terms of comfort and transforms it into little more than a tarp shelter. The inner helps keep warmth in and some of the condensate away from you. If using only the fly you really want to vent this quite well so that the flow of air takes away your perspiration and the moisture that you breathe out so that it doesn’t all gather on the inside of the fly and then drip down onto you. That said, the Vango 200 is a pretty good compromise and you could do a lot worse than to get this. Vango, which makes it, is a very British company and is not readily available everywhere. In future I’ll write up some of the other super-light weight tents out there that are made by other companies such as MSR for readers in America and elsewhere. Another tent of similar weight and function would be the Brooks Range Mountaineering Rocket Tent. Its ultra-lightweight fabric (similar to non-woven Dynemma) puts it in a class of its own. It is tough enough to handle the alpine environment, but weighs in light enough for even the most discerning gram counters. I have used it in South America for a ski mountaineering expedition. Using it with a probe and ski poles for support, (as it was designed, but not limited to) I found this tent extremely strong – even in Andean wind. The Rocket Tent is a featherweight on the scale, like the Vango, but allows for lofty goals in the alpine. I’d recommend giving it a look. Thanks for your comments and I’ll be sure to check out the Brooks Range tent as it is not one that I’ve used yet. i would also be interested to know how it compares with the MSR Twin Peaks or Twin Sister tents as they are intended to be used in much the same way. Thanks for this helpful review. I’m still undecided what kind of tent I should purchase but it definitely helped. 2man by no way trekking weights, come in at 6kg and 4kg these tents both have fss-flysheet support and as you say jakes corners(tri support) on all corners.the later models arent as good as they have external poles(vango took over streamlining into there manufacture) both the spindrift and the vortex have a hydrostatic head of 8000mm on fly 10,000 on floor these tents will withstand a hurricaine and are all tested in wind tunnels.I valley camped in the snowdonia national park uk and a drunk guy tripped and fell on the tent ,my two youngsters where asleep inside, and the tents geo poles held a big guy 3ft off the ground although did have to replace 4 sections of pole.I would use these tents on any mountain.